In the month of May 2016 Staat van Beleg could list 638 human rights violations (and 109 reports/analyses). Every month we are trying to highlight another aspect of the occupation of Palestine. 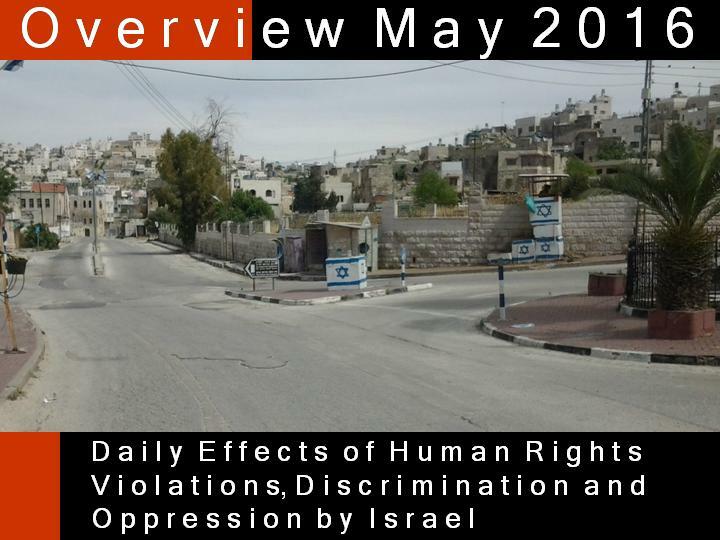 During the month of May one of our team members visited the West Bank, including Hebron. Here you can read her brief coverage of her experiences of her visit to Shuhada Sreet in Hebron (see picture above) with some additional information. Hebron is a Palestinian city, since 2002 under full control of the Israeli army. A city with 160.000 Palestinian citizens, terrorized by circa 600 settlers and circa 2000 Israeli soldiers. Why did things have to get to this stage? There are two causes which have a bearing on the matter. Firstly the massacre caused by the extremist settler Baruch Goldstein in 1994 were dozens of praying Muslims were killed in cold blood and many more were injured. Secondly the closure of the most visited shopping street of the West Bank, Shuhada Steet. Circa 600 Israeli settlers are occupying a part of the old city of Hebron and are ‘protected’ by circa 2000 Israeli soldiers. All shops were closed by the army and Shuhada Street together with some side streets is a forbidden area for Palestinians. As you can see on the picture above you will find checkpoints and blockades all over the area (on the right you can see a soldier in a checkpoint made of concrete blocks and decorated with the Israeli flag). You can also see that the street is entirely empty. As a tourist it is allowed to walk in this street; sometimes you can find a soldier walking or standing. With high speed a car is passing by, a settler! But otherwise it is completely quiet. I see some posters hanging at a wall and when I take a good look I can recognize the face of the suspected perpetrator of the attack on the Palestinian Dawabshe family which took place in June 2015. The father, the mother and a baby of 18 months were killed during this attack and the only survivor, a four years old child, is marked for the rest of his life because of the burn wounds he contracted. The posters are demanding to free this terrorist and they suggest that the punishment of an Israeli is much harsher than that of a Palestinian if he was the perpetrator of the murder. This poster says more than a thousand words about the moral of these settlers. We are talking with some people. One of them is Shadi. His house is located next to houses that are being occupied by settlers. His neighbors are being harassed or threatened so badly that they dare not to stay in their houses. After that a settler family comes to occupy and take over the house. And after that it’s the turn of the neighboring houses. Shadi has five little daughters. One evening a settler is climbing on the roof of his house and throws a firebomb through an open window and injures one of the daughters who is sleeping in the room. A scar on her face will remind everyone for the rest of her life of this incident. 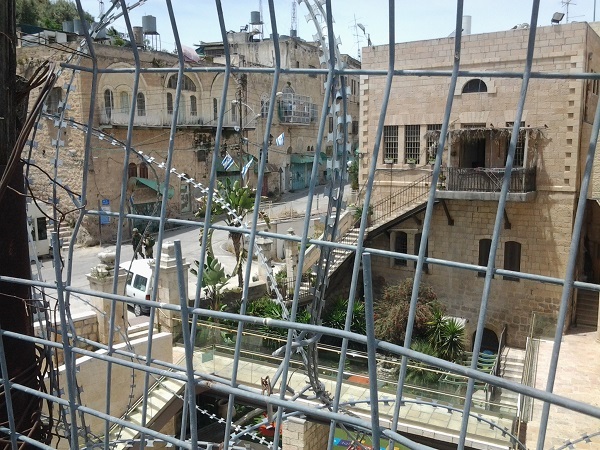 On the roof of Shadi’s house where the fencing and the razor blade wire must prevent settlers to enter. It is very obvious how the military occupation is doing its job in Hebron and how an entire city is being disrupt. Not only because of the restrictions on movement or the violence of extremist settlers but also because of the checkpoints where Palestinians are allowed and forced to pass, for example to reach the Ibrahimi Mosque. At these checkpoints many Palestinians have been executed. At a drop of a heat they are being seen as suspects. The closure of Shuhada Street sees also large economic consequences, especially for the people who are living and working in the old part of the city. 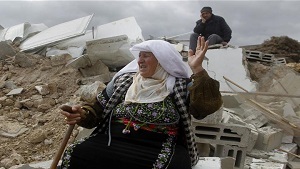 Every day they are facing the effects of the occupation in their economical and social lives. Let’s not forget about the children who are growing up here and have to pass through checkpoints on their way to school and are subjected to violence of settlers including teargas attacks from the army. Visiting Hebron is always an intense experience. What I felt so strongly was the safety of the settlers with a soldier on every corner of the street versus how enormous unsafe the Palestinians must feel themselves. Since October 2015, 57 Palestinians were killed by Israeli police/army in Hebron.